At this stage in the game it feels like Zhang Yimou, the most celebrated of contemporary Chinese directors, who rose to international prominence with his distinctive brand of visually lush romantic melodrama (1987’s Red Sorghum and 1991’s Raise the Red Lantern are amongst his most memorable early works) only to reinvent himself in the early aughts with his gorgeously reworked martial arts/wuxia dramas like Hero (2002), and The House of Flying Daggers (2004), has carte blanche when it comes to selecting projects, and you wouldn’t be wrong or at all surprised at where his latest project, the period epic Shadow, takes the audience. What will surprise you is that, for all of its lavish cinematography, exotic settings, and sterling production design, it all feels drawn from a well of diminishing returns. Shadow never falters on a sheerly sensory level; cinematographer Xiaoding Zhao (The Great Wall , Coming Home ), and production designer Horace Ma (On Wings of Eagles ) give Zhang’s period-set ornately-detailed palace settings a tactile purity that adds what it can to the blurring plotlines and deliberately obfuscating narrative. It’s too bad the bloated plot robs some of the film’s best set-pieces with needless undulation. 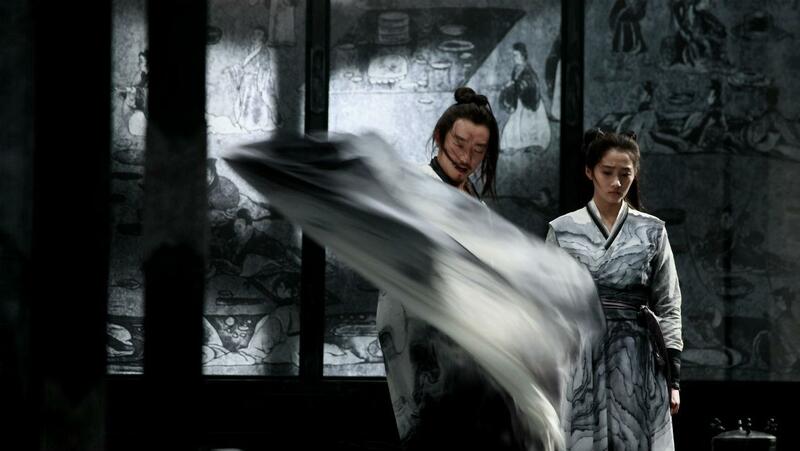 The plot is a Byzantine affair pinned by an impressive dual performance from Chao Deng as both the cunning military leader Commander and his “shadow”, the heroic and sympathetic Jing, with the Commander’s wife Madam Yu (Li Sun) caught in the middle. As a “shadow”, Jing is essential a formidably conditioned and trained double for the Commander, fodder for his enemies and so convincing that even the king (Zheng Kai) cannot tell them apart. Filmed in marvellous monochromatic hues, and rendered almost entirely in mists and torrential rains, Shadow is a large-scale spectacle that, when the plot putters out and the focus is placed upon the tightly choreographed action, allows for an engaging and occasionally brutal elegance to take sway. This is when the film comes alive as epic imagery overwhelms all that’s gone before. Zhang does infuse a fair bit of his signature womanly virtues upon the plot, and for her part it must be said that Li Sun rises above her maudlin material. The balanced and bewitching harmony of Shadow’s many compositions, best represented by the yin and yang pattern at the film’s crux––and the antecedent for the film’s near total black-and-white flush––give the film its best stab at seduction. But so much of Shadow is all fleeting façade and overdone formalism, making a spectacle that tragically becomes too forgettable.